The Gobblin' Goblins Kickstarter campaign will turn 15 days old tomorrow and we are 62% of the way to reaching our goal. A big thank you to everyone who's pledged or supported the project in any way, shape or form. I've got a feeling this is going to go right down to wire so please, please, please keep on sharing those gobbos and their big green butts! Kickstarter is doing us no favours in helping us to our goal, sadly we've been stuck way down in the listings since day one. So if we're going to make it, we're going to have to do it ourselves. With that in mind here's a couple things we have planned! This is a thing that's actually already going on and will run until the end of the campaign! Enter the competition via the link below for the chance to win a £20 Amazon Voucher, plus I'll throw in a copy of the game as a bonus if we fund! If you win but you've already pledged I'll refund the value to the game plus postage off your pledge. The competition is really easy to enter, you just need to answer one question. You can also gain bonus entries via some social sharing, so entering will help to support the campaign! On Friday at 5pm GMT we'll be having a community vote for the design of one of the cards in the game. 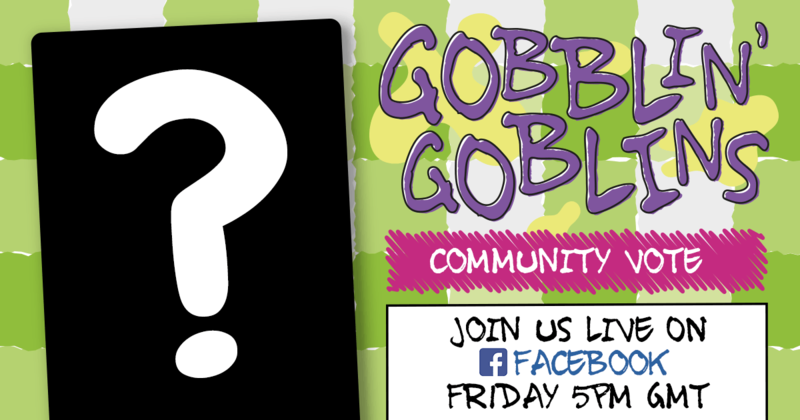 We'll be doing the vote via livestream from the Gobblin' Goblins Facebook page. It's not going to be your standard livestream vote though, we'll be going down an untraditional route! Intrigued? Like the Gobblin' Goblins page and look out for us going live!